New to DoerHub? Join now! 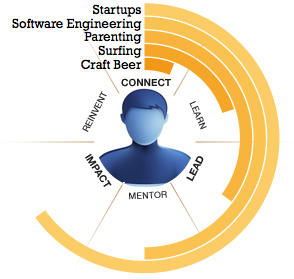 Discover people who share your interests and have complementary skills. Within and beyond your personal network. Post your projects, initiatives, & pursuits, so other doers can join, or help out with tasks, exposure, referals, advice, and resources. Chat, meet, exchange mentorship, move mountains. Your work, contributions, and insights inspire others to join, help, and even fund you. You can collaborate with everyone straight on your DoerHub project page. Privately, or with exposure to the public for project scale. Each interest you pursue takes you through a repeating cycle of needs. 1. At first you strive to connect with others. 2. Then seek to learn. 3. To make it your own by building or leading something. 5. With success comes desire to impact, invest, or influence. 6. Until you are ready to reinvent yourself and do something new. DoerHub is the only place in the world, where you can see who else understands and complements your interests, and can invite them instantly to do more together! 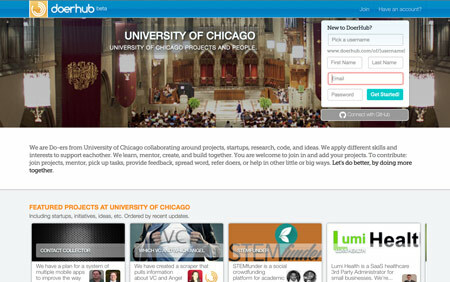 Join collaborative communities at the University of Chicago, Northwestern, Stanford, etc. Check out our sister site DreamList: a new kind of online wish list & registry you can manage with friends and family. Wish list for experiences with loved ones, fund big dreams over time with every special occasion, add gifts of help, charities you support, and gifts from any store. It's a meaningful way to get closer to friends and family by pursuing dreams together and they've just released a Baby Registry and a Christmas wish list as well. We are doers: entrepreneurs, scientists, hackers, students, and subject-matter experts growing our projects and contributing to the efforts of others. Connect based on complementary skills. Collaborate on ideas, mentor and help others. Attract teammates, feedback, advisors, exposure and anything else need for your projects. It's FREE! If you find DoerHub valuable, invite other doers you respect and want to work with. Project leaders can chose to approve/reject new team candidates. You can connect to DoerHub with a GitHub profile. Team chat and private project sections are coming soon. Contribute to the DoerHub project.